Access to Water and Sanitation were included in Millennium Development Goals (MDGs) and in 2010 the UN General Assembly passed a resolution that explicitly recognised the human right to water and sanitation. They will again be included in the Sustainable Development Goals (SDGs) to be finalised in September 2015. Thanks in part to such initiatives, access to these services in urban areas has been gradually improving, although the sanitation MDG remains badly off-track. Since 1990 1.1 billion people in urban areas gained access to improved sanitation, but the urban population grew by 1.3 billion. For urban populations in the developing world 20% still rely on unimproved sanitation and 13% on unimproved sources of water. For slum dwellers, however, the situation remains even worse. Over 100 million urban dwellers still defecate in the open (WHO/UNICEF 2013). And beyond that, most faecal sludge is discharged untreated into the environment. The urban poor usually pay more for water than people in the rest of the city, particularly in times of water shortages, while receiving a poorer quality service in terms of water safety and reliability of supplies. This creates an ‘urban penalty’ on health for those living in informal settlements. There is growing evidence that repeated bouts of diarrhoea for children under 5 are a major cause of stunting and malnutrition. Analysis of data from Nairobi slums found child mortality rates were 151 per 1000 births compared to 113 for rural areas and 112 nationally. It is less relevant to measure distance to a water point, than time spent collecting water because people in urban slums may spend a long time queuing. A water point may be available, but the supplies from it may be highly unreliable, with taps shut off for hours or days at a time. People need both more reliable supplies from the water utility, and improved access to rain water and ground water. For sanitation, the problem may be less about whether toilets are available, but how faecal matter can be safely emptied, transported and disposed of. In crowded urban areas, access to water and sanitation may be particularly difficult for women and girls. Toilet designs at home and in schools may provide no space or facilities for women and girls to manage their monthly menstrual cycles. They may not afford adequate privacy. They may be too far from home or too expensive, when women are also looking after young children. 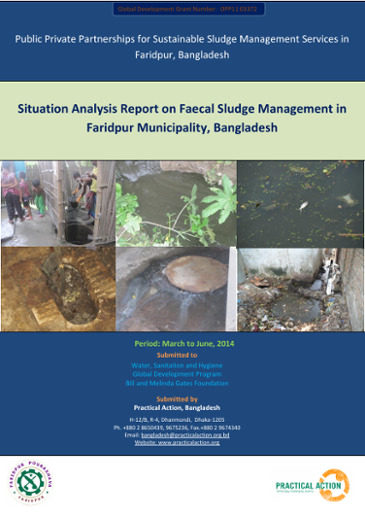 Practical Action are working to improve systems for faecal sludge management (FSM) across the sanitation chain, in ways which recognise and improve the work of existing informal pit emptiers. 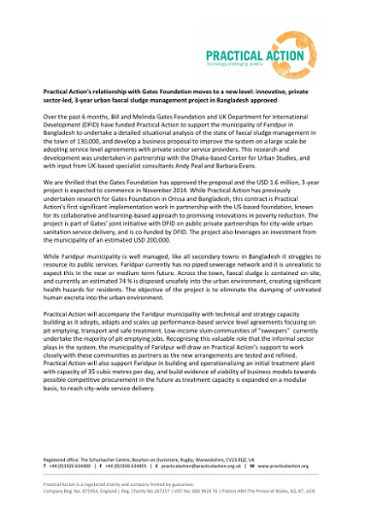 In Bangladesh, Practical Action are working in the rapidly growing city of Faridpur, with the support of the Bill and Melinda Gates Foundation, with the aim of creating a city-wide solution, introducing incentives for safe disposal, sharpening the use of subsidies, and crucially doing this through the inclusion and mainstreaming of existing informal service providers. Practical Action are working with the Municipal Government and pit emptiers to address the situation in an inclusive and sustainable manner. The proposed new system aims to build on the strengths of what already exists. It aims to incorporate the role of the informal sector, formalising their activities only to the extent that it will help both them and the municipality deliver a better service. Incentives will be in place that should drive both quality and the expansion of the system. This will be combined with both a public awareness campaign and stiffer penalties to try to reduce unsafe practices (where toilets are connected directly to storm drains or open water bodies). Practical Action are developing expertise in adapting Community led total sanitation (CLTS) methodologies to the urban context, working towards achieving Open Defecation Free status for slum communities in both Kenya and Nepal. CLTS is an innovative methodology for mobilising communities to eliminate open defecation. 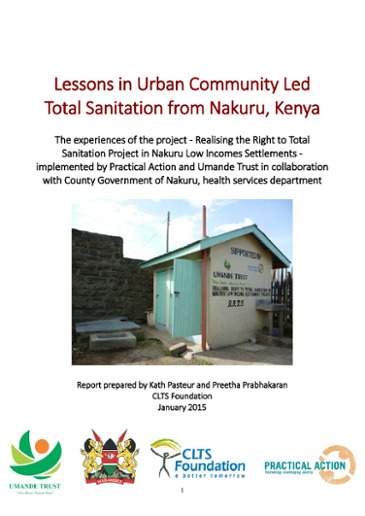 Practical Action and Umande Trust implemented the project 'Realising the Right to Total Sanitation' in Nakuru, Kenya adapting this methodology to an urban context. The project has taken steps to address wider issues of faecal sludge management, solid waste management, access to clean water, and waste water management. It has worked with lending institutions to assist landlords in accessing the necessary finance to upgrade their facilities. It has also trained and supported government staff to ensure that the processes carried out in this project can be replicated and taken to scale within the county of Nakuru. The project has achieved much of its success through effective coordination and collaboration not only with the County Government Health Department, but with a range of other stakeholders at the local, county and national level. 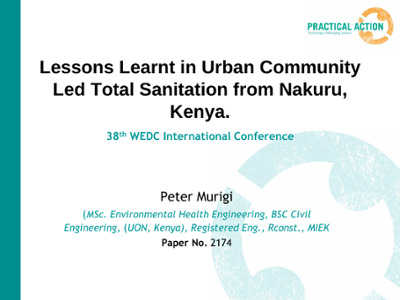 Lessons from this project will be valuable for the scaling up of Community Led Total Sanitation in Kenya and beyond to ensure that urban sanitation is addressed alongside rural sanitation. The challenges faced and the solutions found in this particular urban context are not necessarily universal to all urban situations. There are very different issues to address in places where people are squatting on land, where populations are more transient, where a town or city is built on rock, or where disposal of faecal waste is more problematic. Conversely, the situation may be far easier where the population is less dense or the planning and public health regulations are more relaxed. 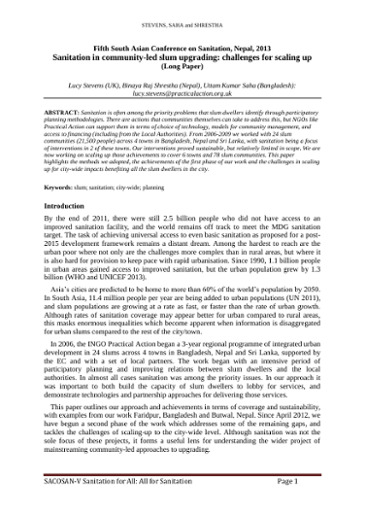 This particular case certainly offers considerable guidance to other agencies aiming to address urban sanitation using CLTS, though they should not be seen as universally applicable solutions. 1. Low toilet coverage and strong preference for or habit of OD High toilet coverage but they are highly unsanitary. OD is out of necessity rather than preference or habit. 2. Majority of households own land on which they can build their toilets Most households are tenants and have to rely on landlords to provide sanitary toilets. However, it is tenants' role to maintain them well. 4. The triggering methodology is principally based on eliciting feelings of shame and disgust to motivate behaviour change. The triggering methodology with landlords is based more around obligation and threat of legislation. Eliciting disgust is still a motivating factor in triggering with tenants. 5. The key challenge is triggering behaviour change to break the long held habit of open defecation. The key challenge is ensuring adequate provision and maintenance of facilities. Open defecation is no longer a habit but an outcome of poor facilities. 6 Once a toilet is full, there is usually space to build more within the household compound. Space is limited and density of population is high resulting in the need to dispose of faecal sludge outside the plot once toilets fill up. 7 Households can build very basic low cost toilets, starting and the lowest rung of the sanitation ladder if they choose. There are often regulations about the standard of toilets substructure and the superstructure. Negotiation with authorities can be an important aspect of intervention. 8 Households can usually finance low cost toilet building without external finance. Landlords often require external finance in order to be able to adequately upgrade sanitation facilities. This may require negotiating a loan facility, whether through banks or a community fund. 9 There are few stakeholders external to the community who have an influence on sanitation provision. There are several stakeholders involved, such as tenants, landlords, planning department, public health officials, water and sewerage companies. 10 As there are few stakeholders involved, the intervention process can be relatively fast. Due to the regulatory environment and the number of stakeholders involved the intervention process, even before any triggering takes place, can take quite long. 11 Natural leaders and community consultants are key players in driving and scaling up CLTS In this particular urban context natural leaders and community consultants were not developed as Community Health Volunteers already existed. Waterlines is the world's only journal devoted entirely to low-cost water and sanitation.